Hybrid versions of the RAV4 are not only thriftier than their gas counterparts, they’re also quicker. The Limited model adds such niceties as driver-seat memory and a height-adjustable power liftgate. 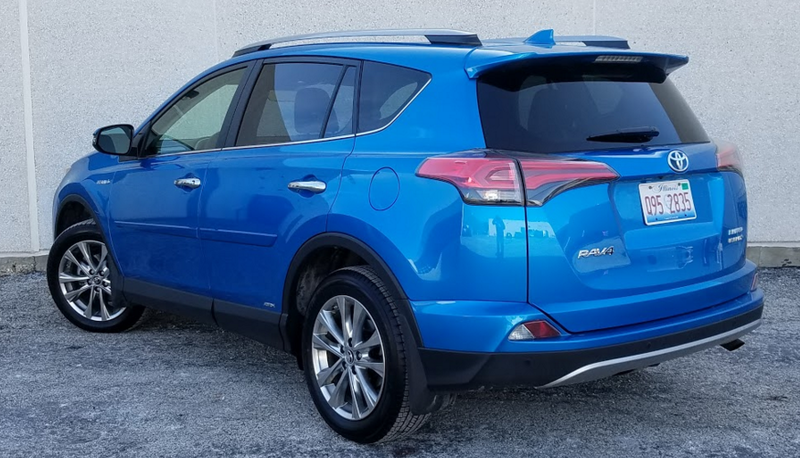 With the hybrid version being dropped from the redesigned 2017 Subaru Crosstrek’s roster, the Toyota RAV4 and Nissan Rogue become the only members of the popular compact-crossover class to offer an AWD hybrid model. (Kia’s new Niro is a hybrid, but it’s front-drive only.) We’d previously tested the base RAV4 Hybrid — the XLE — but this time sampled the line-topping Limited, with an SE Hybrid sitting in between. In all cases, the hybrids are all-wheel drive, and they only cost $800 more than the gas all-wheel-drive versions of the same trim level. 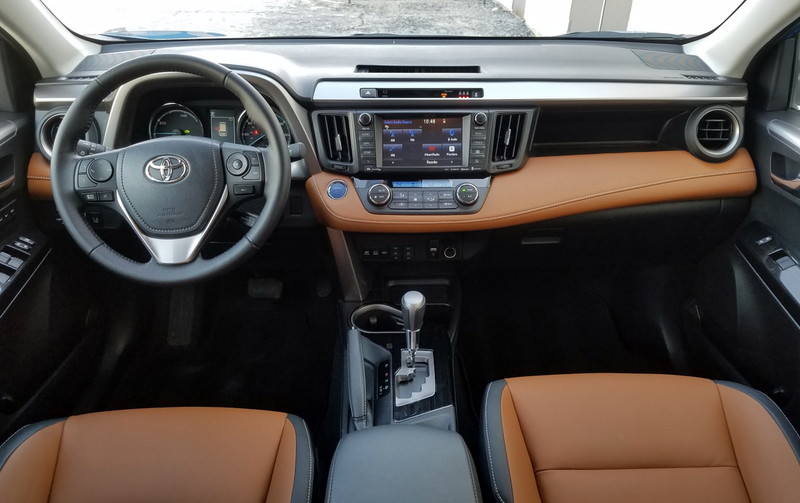 In return, they get considerably better fuel economy (particularly in city driving, but even the EPA combined figure is 7-mpg higher) and are also quicker: Toyota says they do the 0-60-mph dash in 8.1 seconds vs. 9.0 for gas models. Our tests have tended to validate those claims. A 2016 AWD gas SE averaged 24.2 mpg, whereas test XLE and this Limited Hybrid averaged about 31.2 mpg, or 7 mpg better. Furthermore, we timed this Hybrid Limited at 8.2 seconds 0-60, nearly matching Toyota’s number – and the Limited is a bit heavier than the others. Add in the fact that the hybrids give up very little in the way of cargo space to their gas counterparts, and they become exceptionally attractive alternatives. Added on the Limited are auto-dimming rearview mirror, memory for the power driver seat, built-in navigation system, and chrome wheels as unique features. It’s also the only one to offer the rather eye-popping “Cinnamon” brown interior trim fitted to our test vehicle. The most notable option was the $1435 Advanced Technology Package, which brought – among other things – a 360-degree camera, premium audio system, satellite radio, and traffic information. RAV4’s interior is nicely laid out and includes numerous storage cubbies. The Limited is the only trim level to offer this black/Cinnamon brown color combo. Other than that, impressions of the Limited mirror those we had of the earlier Hybrid XLE. Acceleration is quite good and the powertrain is very responsive to throttle inputs, especially at around-town speeds. Ride and handling rate well for the class. Visibility is only restricted to the rear corners, but the standard 180-degree rearview camera helps when backing – as does the Limited’s rear-obstacle detection – and the 2nd-row headrests fold to improve the view out the rear window. Passenger room both front and rear is suitable for full-size adults. Even if the front seat is pushed all the way back, an average-size adult can fit behind it, and the step-in height eases entry and exit. Audio and climate controls are fairly straightforward, though some at the far right (including the tuning knob) are a stretch for the driver to reach. Cabin storage is fairly impressive and includes a large open dash bin over the glovebox. 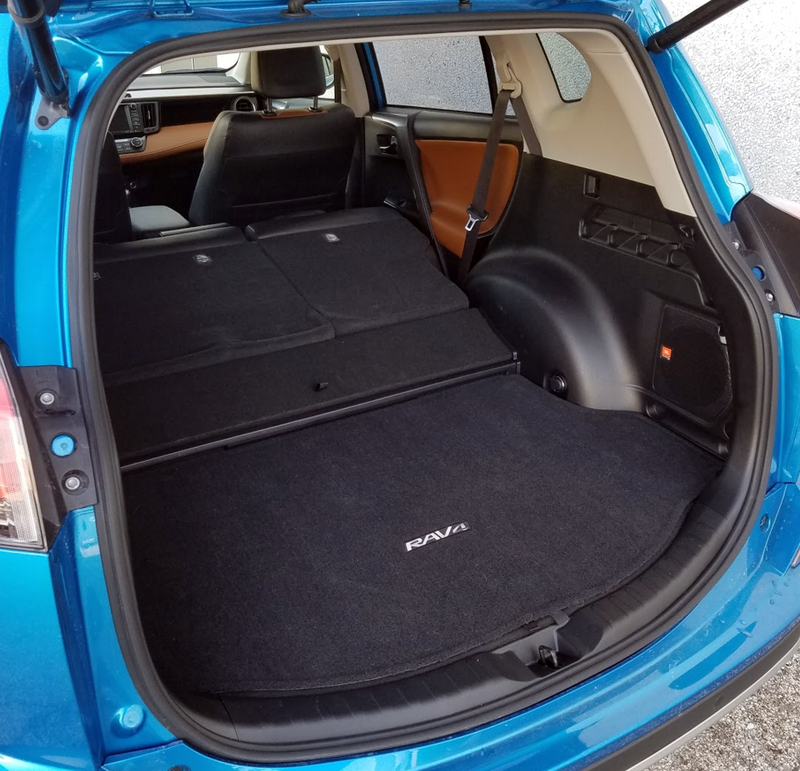 The cargo floor (with help from an intermediate “flap”) can be set to provide a relatively flat cargo surface with the rear seat back folded, but the floor is raised at its leading edge, so it’s not level. Hybrids sometimes sacrifice cargo space to the required hybrid battery, but little is lost here. The cargo floor can be set at two positions: low for maximum cargo height, or raised at the front to bring the floor nearly level with the folded rear seat backs. A panel flips up to cover the gap between the two, and there’s some cargo space beneath that panel. Positioned as such, the floor runs “uphill,” so it’s flat if not actually level. Niceties include a wide underfloor bin that can hold the roll-up cargo cover when not in use, and the Limited’s standard height-adjustable power liftgate. 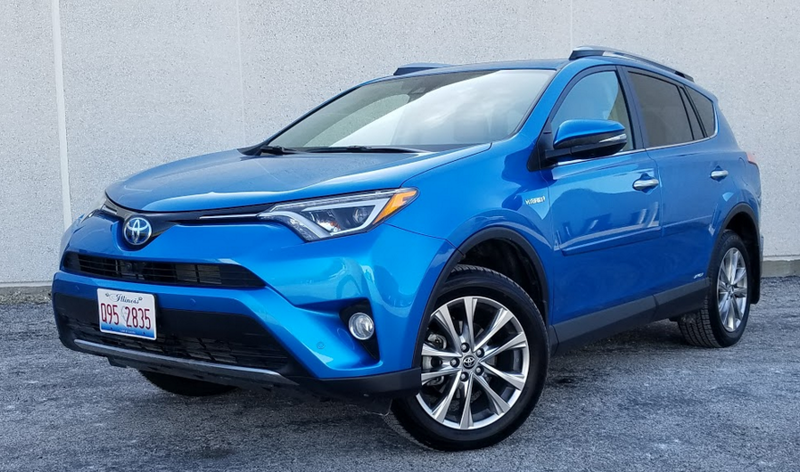 We’ve been quite impressed with the RAV4 Hybrids we’ve driven, with this top-line Limited bringing some worthwhile features for its extra cost. New for 2017 is the aforementioned SE model, which adds some sporty touches to a surprisingly sporty hybrid, giving Toyota an even stronger presence in the competitive compact-crossover class. Toyota’s RAV4 is nipping at the Honda CR-V’s heels for the title of “best-selling compact crossover,” and the Honda doesn’t offer a hybrid version. 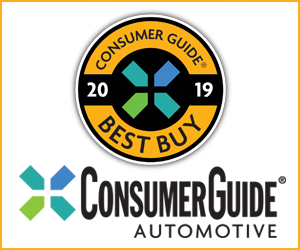 That — and the fact that they cost little more than their gas counterparts — make the RAV4 Hybrids “must see” entries in the segment. Written by: The Daily Drive staff on April 20, 2017.